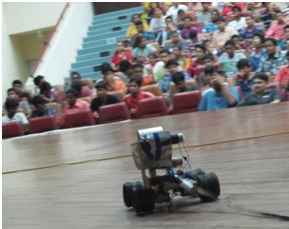 30th July saw throngs of curious first years fill up Kalidas Auditorium as Technology Robotix Society unveiled its action packed schedule for 2012, along with a showcase of the pathbreaking ventures into robotics at Kharagpur and around the world. With new frontiers opening up including aerial robotics, underwater robotics, machine learning etc., whole new dimensions have opened up with regard to the projects and events being lined up for ROBOTIX 2012 and in the lead up to it. With a one and a half hour session on building a manual differential drive, which of course is the base for most of the ground – based robots, the first challenge thrown open to all first years is the Mechanical Design Contest which requires participants, in groups of three or less, to “design a robot which can traverse on zip lines while shooting down balls into bulls eye targets below”. In a few weeks’ time, first years will get to fight it out at the RoboSoccer Challenge with their DDs tweaked to play soccer. Meanwhile, events for ROBOTIX 2012 have been announced on our website. To all you robotics enthusiasts, buck up for a grand challenge! Visit www.robotix.in for details.